Stimulus – over $800 billion (close to a Trillion with interest) that Obama demanded the completely Democrat controlled House & Senate pass or unemployment would go past 8%. Earth to those who supported the porkulous – it was nothing more than Democrat pet projects that had little to nothing to do with infrastructure jobs or actual jobs that would ever serve a purpose to the United States taxpayers (other than Obama, Pelosi and Reid’s left wing buddies). It was an epic failure. Auto Bailout – This was nothing more than a disgusting display of union payback. Obama screwed over the bondholders for the UAW when sending checks to GM and Chrysler (NOTE: Ford did NOT take a dime in bailout money) . Obama forced hundreds of auto dealers (who didn’t cost GM or Chrysler a dime) to close their doors – even those who had stellar sales and were in business for sometimes over 100 years. Cash for Clunkers – This program not only cost taxpayers much more than the $4,000 credit given to those who purchased new vehicles but it hurt the used auto industry , parts dealers and mechanics because Obama forced all of those vehicles to be destroyed. Fishing Industry – The NOAA has been perverse in their ‘catch share’ regulations, so much so that many lifelong fishermen are now unemployed and will be until the corrupt NOAA is put to rest. Oil Industry – Obama’s illegal oil moratorium killed or put on hold thousands of jobs in the industry (meanwhile he vowed to help Brazil dig for even deeper ocean oil); even forcing some rigs to leave for ‘greener pastures’. This has had a horrific effect on the oil industry and thousands of people who rely on it in a domino effect. Coal Industry – Obama’s EPA is now trying to push even further regulations on the coal industry (which powers this country) to the point where some aren’t even bothering to continue in it any longer and to the point where many will lose their jobs. Of course, this shouldn’t be a surprise since Obama explicitly stated he wanted to bankrupt the coal industry via Cap & Trade when he was running for President. Student Loan Industry – Obama decided to have the federal government take over and run the student loan industry that previously was run by the private sector again killing thousands of jobs. All one has to do is take a look at Fannie & Freddie or the Post Office to see how efficient and effective this idea will be. Financial Reform Bill – Not only does this bill hurt consumers but it kills jobs and promotes corruption. This bill was written by the very people (Dodd & Frank) who aided in the financial mess in the first place. Fannie & Freddie – The Democrat’s favorite corrupt organization that had the biggest hand in the Housing crisis is taking billions of dollars from taxpayers to bail the failing (and should be allowed to fail) organization out. This is throwing bad money after bad. Mortgage Financing Scam – Obama spent billions of taxpayer $$ to help people refinance their mortgages so they wouldn’t lose their homes . The program cost billions and not only pushed people into foreclosure who weren’t going to foreclose but helped very few others. Illegal War in Libya – Billions of dollars spent on a war that Obama refuses to call a war and a war he also refuses to get permission from Congress to be in. There is no reason for the U.S. to be in Libya let alone spend billions of dollars to be there. No budget – Neither Obama nor the Democrats have passed a budget in over 800 days. This is not only irresponsible but shows the Democrats’ complete and utter contempt for Americans. They are elected to do a job and they can’t even handle the most basic element of that job – producing a budget. Extending Unemployment for 99 Weeks – It has been proven throughout the WORLD that extending unemployment benefits only keeps people unemployed for longer. This has proven true yet again. You probably all know someone who stayed on unemployment the entire 99 weeks and then miraculously got a job when it was ending. Killing 500,000 Non-union Jobs – Obama has decided he wants to increase fuel standards (regardless of the fact that automakers have been doing this on their own the past 20 years). “By 2025 auto makers will have to meet fuel efficiency standards that brings “new cars to 54.5 miles a gallon by 2025, roughly double the current level, in a bid to reduce U.S. oil consumption,” says the Wall Street Journal.” Of course, these only apply to automakers in the U.S. – kiss even more jobs goodbye. Obamacare – One of the biggest takeovers of any industry in United States history, Obamacare will hurt consumers, the medical profession, businesses and taxpayers while hurting the economy in general. EPA Food Regulations – The EPA is putting ridiculous regulations in place without any input from Congress or testimony from experts. This seems to be par for the course for the Obama Administration and this hurts consumers with higher costs , especially the poor, working and middle classes. Increase in Foreign Aid – Obama seeks an 8% increase in foreign aid over last year; Foreign aid that often reaches countries who absolutely despise the United States and often ends up in the hands of the corrupt leaders that run these countries without ever reaching its goal to help the actual people of the countries. Billions Spent on ‘Green Jobs’ – Obama is spending billions of tax dollars on green jobs yet what exactly ARE ‘green jobs’? Where are the statistics showing that all of the billions he is spending have created any ‘green jobs’? (Note: There ARE no statistics – even the Bureau of Labor Statistics can’t figure this one out.) Just know that Americans are paying billions for them. Printing Money – Also known as Quantitative Easing – where the Federal Reserve feels the need to print ‘monopoly money’ in order to somehow stimulate the economy. The problem is that Quantitative Easing actually hurts the economy in the long run by devaluing the dollar (amongst other negative impacts.) Who does this hurt the most – the poor, working and middle classes. The sad part is that this isn’t a complete list but it proves the point that Obama’s policies are destroying the U.S. economy. The man is a Harvard graduate. I would like to assume he isn’t a complete and utter moron unless Harvard’s standards have severely trended downward. If someone who had absolutely no clue about politics or economics read this list and all of the destruction that it is causing, they would have to come to the conclusion that whoever is putting these policies into place is seeking to destroy the country. It is as clear as day. 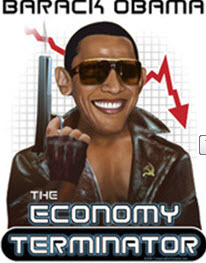 Obama has a plan – it is to continue his destruction of the economy. This entry was posted on Saturday, July 30th, 2011 at 12:43 pm	and tagged with destruction, Obama Plan and posted in America, Democrats, Economy, Obama. You can follow any responses to this entry through the RSS 2.0 feed.